Bright, wondrous, and bubbly, Seussical, is an odd little show, but one that is filled with positivity and happiness. This enthusiastic group of performers throw everything at the production, and I’d challenge anyone to leave the theatre without a massive grin on their face. Littered with playful and uplifting songs, the musical mixes a number of Dr. Seuss’s better known stories during its short 75 minute running time, mainly centring on Horton the Elephant. The action in James Tobias’s production moves at such a lightening pace that you barely have chance to digest the previous scene before being taken off into a whole other story, though this is also a strength, particularly with its core target audience being children, as it does not allow you any time drift off. Justin Williams and Jonny Rust transform the Southwark Playhouse’s Large into a beautiful world of colour and magic. With pastel painted doors at the back of the stage, rainbow striped floor, and weird and wonderful plants sprouting out all over, careful consideration is taken to effectively using the otherwise bare performance space. A nice additional touch is the entrance to the theatre, painted with the iconic red and white stripes of Seuss’ most famous creation. Opting not to be literal with the animals, Rachel Cartlidge instead designs costumes appropriate to the personality of the characters with clear colour schemes differentiating the different groups. Ben Jacob’s lighting makes the stage feel almost dreamlike, again adding to wonder of the creation. 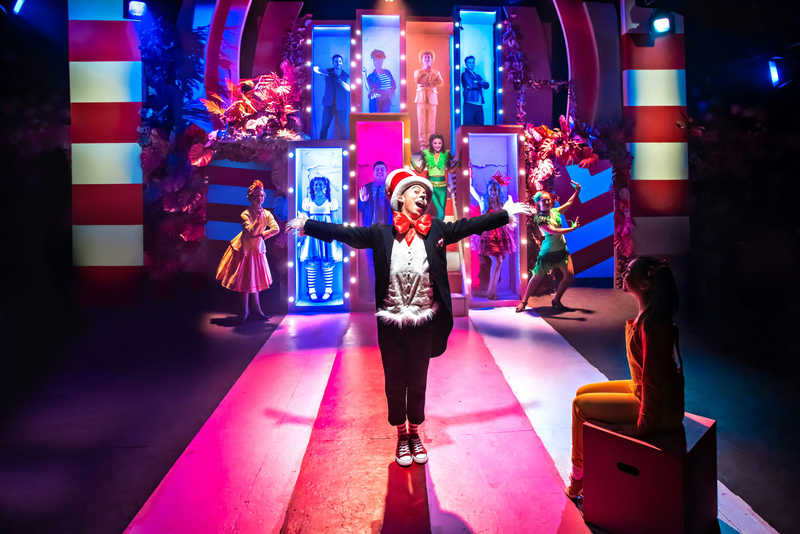 Seussical is not a show to challenge its actors, with the pleasant but simple score not requiring too much and the characters needing little more depth than what is on the page. That’s not to say that this cast do not throw everything at the show, with endless energy and tons of charm. Scott Paige is sweet and thoughtful as Horton, while Amy Perry gives Gertrude tragic optimism and positivity. Anna Barnes brings a naive and joyful excitement to young Jojo and while she does do a fine job in the part, it may have been more effective if a child had been cast instead. It is Marc Pickering, as the Cat in the Hat, who keeps the whole show together. Acting essentially as the show’s narrator, he owns the stage with his lavish representation and constant interactions with the audience. Popping up as countless cameos, each with its own unique (and often over-the-top) characterisation, Pickering is able to show-off his talents as a comedy actor. He is both mischievous and lovable and does complete justice to a character that will have been prominent in so many childhoods. This heart-warming musical is a lovely kid’s show with enough jokes thrown in for the adults too. While it is unlikely to blow you away, Immersion Theatre’s production does everything it needs to for a fun family evening at the theatre.